The original blue and orange SAM Splint is acclaimed by emergency care providers and outdoor enthusiasts worldwide (and even beyond the Earth, on NASA space shuttles). The SAM® Splint is the gold standard in splints and is still Made in the USA. Built from a thin core of aluminum alloy and sandwiched between two layers of closed-cell foam, the SAM Splint can be bent into any of three simple curves, becoming extremely strong and supportive for any fractured or injured limb. The SAM Splint is incredibly lightweight (only 4.0 oz. ), and no other device offers so many variations for the treatment of orthopedic emergencies. The SAM® SPLINT is based on an ancient construction principle: curves are strong. The reason lies in the physics of curved surfaces, the same physics that allows skyscrapers and bridges to be built of I-beams and hollow columns rather than heavy steel pillars. A flat piece of sheet metal bends easily, but if you mold it into any of several “structural curves,” it becomes much more rigid. Many such curves are possible, but for splinting with the SAM® SPLINT, you need only three basic curves. With these, you can convert a simple SAM® SPLINT into something so strong that people have even used it as an emergency canoe paddle or snow shovel. That’s more than strong enough for any conceivable splinting need. 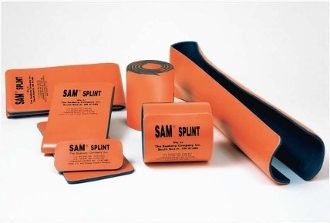 Also available is the SAM Splint XL at 5.5″ wide, for improved support and immobilization of larger individuals.